Cry baby, cry. Make your primary caregiver sigh. There's a lot of technology out there for helping you deal with those little creatures that infest your life, demanding attention from you every waking moment, and generally making a mess. Yes, that's right: your offspring . Or, someone else's offspring, if you prefer. While I don't own a baby of my own, my cousins who live not far from me have two little girls aged two and three months respectively, and these are just two of the seven little kids in our family in the past several years, so I've had a fair amount of experience. 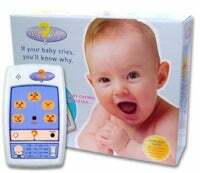 That said, I'm a bit skeptical of the Why Cry Baby Crying Analyzer which claims to analyze "the baby's crying power, frequencies of cry, intervals between crying, and associates the baby's cry with an established pattern programmed into the unit." Your options are Hunger, Boredom, Discomfort, Sleepiness and Stress. Stress? Man, what do babies have to be stressed about? Do they have deadlines? Bills? Mortgage payments? No, they just have to lie around, eat, play, sleep, and occasionally gurgle. This kind of reminds me of those gizmos that are supposed to translate what your dog is saying when it barks at you. Then again, who am I to argue with a product recommended by the Spanish Association of Midwives.